This weekend, the Solar Sunflower project was selected as one of 5 finalists to advance to the Switch Philly event on April 23 and compete for a $5,000 prize. 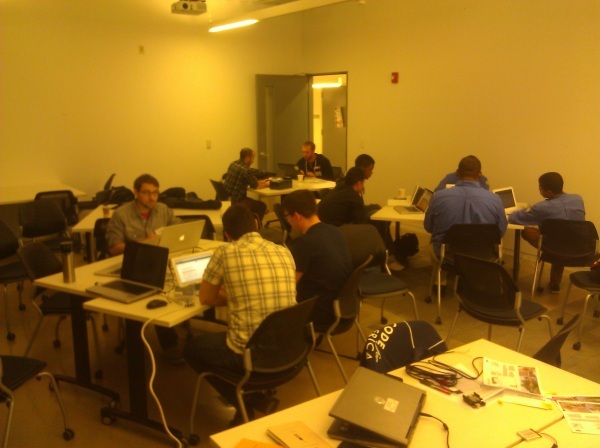 The field was narrowed down at the AT&T EduTech hackathon at Temple University on Saturday. 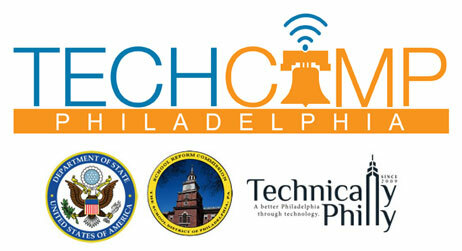 Like TechCamp, the hackathon (organized by AT&T, Jarvus, Technically Philly and Temple’s Urban Apps and Maps Studio) focused on using technology to improve education. Some of the other projects included a mobile app that helps students find the safest walking route to school; a game app that uses a fantasy-football approach to tracking learning progress; and an app that connects students with tutors. Not all our team was there, but Chris Nies and I were able to present a working demo of real-time sensor data being posted to the web in front of an audience and a panel of judges. It sounds pretty rosy in hindsight, but to be honest we spent hours just trying to send data via Temple’s WiFi network; these things happen. Thanks to Jarvus’ Chris Alfano and Technically Philly’s Brian James Kirk for their support and encouragement. Here’s Technically Philly’s coverage of the event. 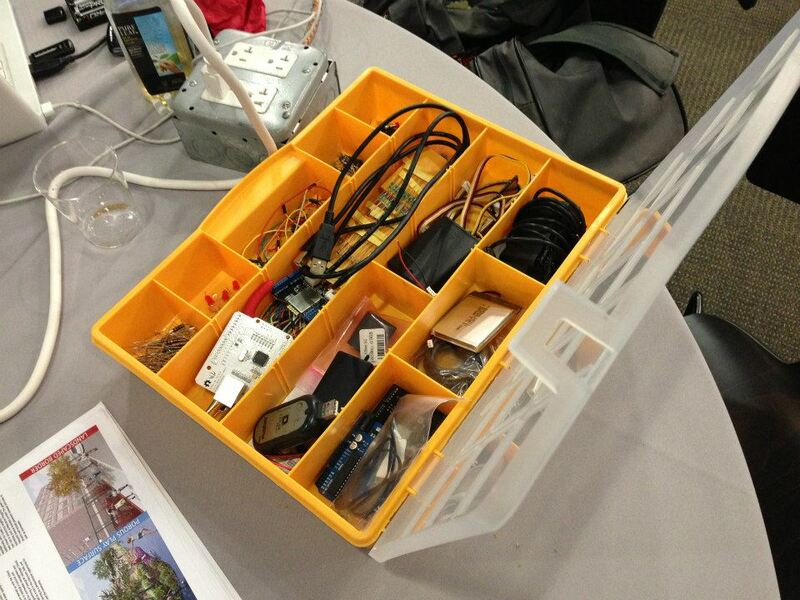 We stole their photo of our box of Arduino stuff, above. 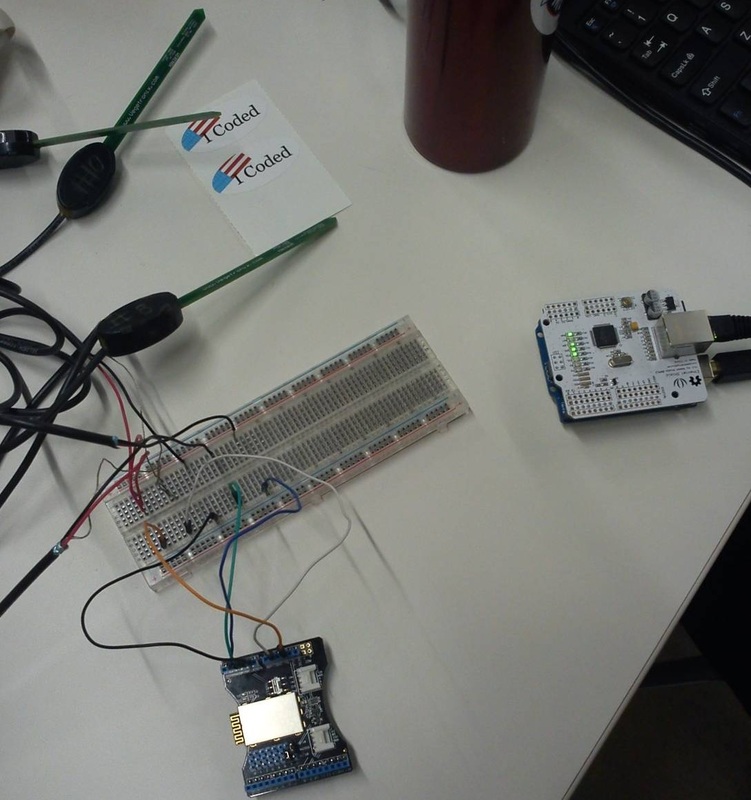 We’ve been hacking at a hackerspace for our next hackathon. For me, the term “hacking” is one of the more egregious tech misnomers, because it seems to imply taking something apart. Of course, it used to mean something different (such as breaking into a computer system) but all I ever see at hackerspaces (places where hacking occurs) are creative people making new things by grabbing data from the web, modifying code and bending it to their will. Devnuts, in Northern Liberties, is where we’ve been gathering on Tuesday nights for the Code For Philly meetups. That’s not us in the photo of the Devnuts space above, but you can spot Code For Philly organizers Christian Kunkel and Chris Alfano (who also work at Jarvus Innovations). The Code For Philly meetups are a great way to get started on a project, learn a new tech skill, or just see what people are doing. The sense of community is amazing, and we’re grateful for all the time and resources that Chris, Christian and others put into organizing the event. In addition to Devnuts, there are many other hackerspaces in Philly worth checking out. Last week, I visited Hive76 and spent a few hours soldering a circuit board. Thanks to those guys for their advice and letting me use their equipment. I hope to someday visit and use NextFab studio, which is more of a building/manufacturing space that might be useful when we start to build the sunflower and the waterproof housing for the sensors. I’m sure there are many more venues out there—many have an open house night or introductory workshops for the uninitiated. Anyone who wants to keep up with the tech scene should bookmark Technically Philly. The site is fairly relentless in documenting all the events and news that involve local startups and tech projects. But as mentioned before, there’s a hackathon coming up: The AT&T EduTech hackathon at Temple University on April 6. 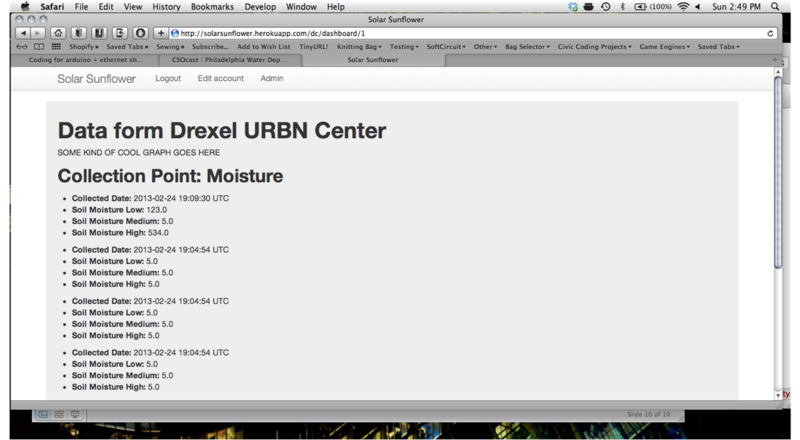 We’ve smoothed out the kinks in our code and have the Arduino posting sensor data to the website. On the wish list is a multi-line graph to plot the data in real time on the site.